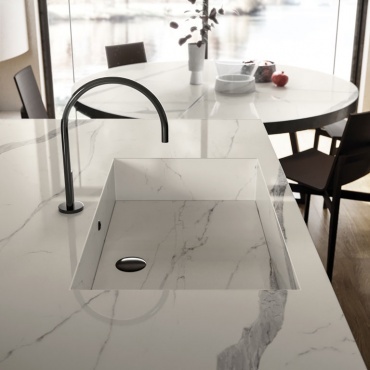 Statuario Select by Atlas Plan. Elegant and compact with a pearly white background traversed by characteristic lead gray veining that will enhance any environment. The light, delicate tone can be used to create aesthetically striking settings for commercial and luxury residential spaces. Large-size porcelain stoneware with a marble effect. Statuario Select slabs come in the size 162x324cm and are available in a glossy lapped finish with a thickness of 12 mm and a silk finish with thicknesses of 12 and 20 mm. Thanks to Statuario Select Bookmatch (or butterflied), refined decorative solutions can be created to exquisitely enhance kitchens, bathrooms, hotel lobbies and conference rooms. Habitat Statuario Select: for this elegant kitchen setting, Statuario Select silk is paired with Arbor Cognac by Atlas Concorde. 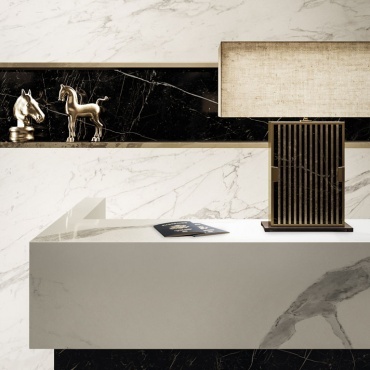 For this sumptuous hotel lobby, Statuario Select lappato lux is presented with Nero Marquina by Atlas Plan and Statuario Select and Nero Marquina by Atlas Concorde.